The SCOTT E-Contessa Scale 730 is a high performing eMTB with a forgiving design primarily for ladies. It’s highly affordable price tag, yet outstanding level of components and performance make this eMTB a class act. It’s geometry differs slightly to the standard E-Scale 730 and is more forgiving for the lady rider. Powered by the Bosch Performance CX motor and huge 500Wh battery, the SCOTT E-Contessa Scale 730 is a nimble and agile performer. It weighs in at only 21.1kg. The high torque CX motor from Bosch finds itself semi-integrated into the frame for an even more balanced and sporty look. The exhilarating ride of the SCOTT E-Contessa Scale 730 is a combination of balance, well thought geometry and a gutsy performance. Suspension is provided by some great Rock Shox Judy Silver RL Solo Air forks with 120mm of travel and remote lockout. This hard tail means business, and is capable of taming even the most hostile of terrain. Braking is effective and dependable, thanks to Shimano M425 hydraulics on 180mm rotors. The 730 is all about delivering a great and gritty performance, and it does just that. Syncros X-30S / 32H / 25mm tubeless ready rims come with Maxxis ReKon Kevlar Bead 2.8″ Plus tyres. They provide a tough and resilient wheel on which the 730 performs admirably. Gear changing is solid, slick and reliable. The Sram NX111-Speed derailleur provides a good range of gearing via a wide range 11-42T cassette, and makes all terrain accessible. Gear changes take place effortlessly thanks to Sram NX1 Trigger shifters. The frame on the E-Scale is precision made, and utilises 6061 Alloy custom butted tubing with internal cable routing for smart lines and stunning good looks. SCOTT continues to use additional quality components with the Syncros brand on the headset, handlebar, handlebar stem and seatpost. Th eSyncros FL2.5 WS women’s saddle is ultra comfortable. 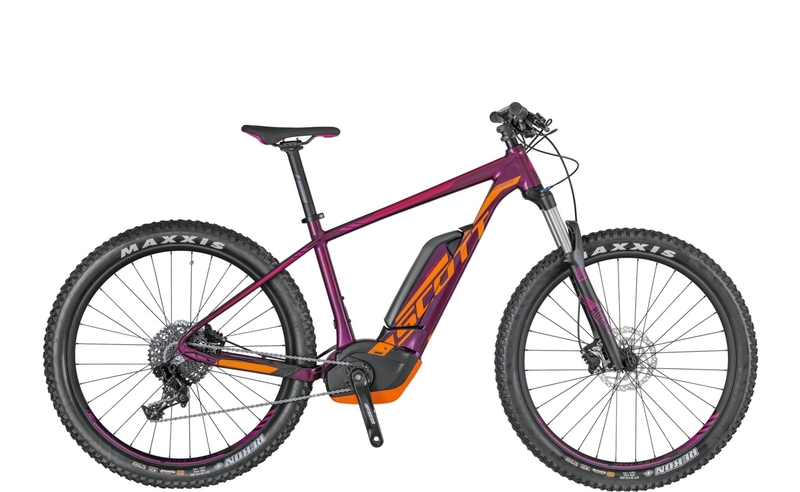 The SCOTT E-Contessa Scale 730 is a great entry level hard tail with the lady in mind. Fitted with Bosch’s highest torque Performance CX motor and largest 500Wh battery, it out performs many. Combine superb performance with a beautifully soft turquoise and white coloured frame, and SCOTT have a real winner. Syncros OE / Tapered 1.5" – 1 1/8"